Cris Derksen is a young half-cree classically trained Canadian cellist whose captivating melodies and steadfast baselines have captured the attention of local and international audiences. She is a diverse musician, easily melding into hip-hop, rock, folk, country, or whatever type of music to bring an intense ball of musical passion to her work. Using a loop station and effect pedals, she is able to create an inspiring multi-dimensional auditory experience. She uses her voice in spoken word and song to layer melodies on top of each other to construct a song form in a way that is uncharted for most classical players. Using sounds from her inherited past Cris mixes the traditional with the contemporary over and over again in both the cultural world as well as the music sphere. Although Cris is an emerging artist, she has built up a strong resume performing at festivals such as WOMEX World Music Expo in Sevilla, Spain, with Inuit Throat Singer Tanya Tagaq. The Respect Festival and Colors of Ostrava in the Czech Republic. SXSW South by Southwest, The Vancouver Folk Music Festival, Dawson City Music Festival, Edmonton Folk Music Festival, Brandon Folk Music Festival, APCMA Aboriginal People’s Choice Music Awards, CAMAs Canadian Aboriginal Music Awards. As a Composer Cris has Composed for Karen Jamieson Dance, The Tomorrow Collective and Aerial Firedance Troupe; Firebelly Productions. She has also performed with international Hip-Hop artist Kayne West at GM place in Vancouver. As a session musician her diversity continues as she has built up a strong resume recording with Tanya Tagaq on her Album Auk, the Album earned 2 Juno Nominations for Best Aboriginal Album and Best Instrumental Album. Rae Spoon, The Switfy’s, Kinnie Starr, Lightening Dust Memberʼs of Black Mountain, Ladyhawk, Bison, E.S.L, Girl Nobody, Fan Death as well as working with Native composer Russell Wallace. 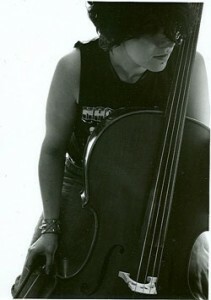 Cris obtained a Bachelor of Music in Cello Performance at UBC and shared the Principle Cellist of the UBC Symphony Orchestra title.